Billboard Generation I was the first YAH call for entries within Bloomington area schools in Celebration of National Youth Art Month. 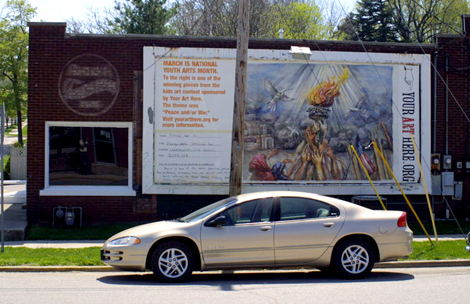 The contest theme was Peace and/or War, and it resulted in two youth art billboards on commercially rented spaces in Bloomington, IN. Peace, Worth Striving For, by Esther, and This is Your Choice, by Benjamin went up for display the day before the War with Iraq started. 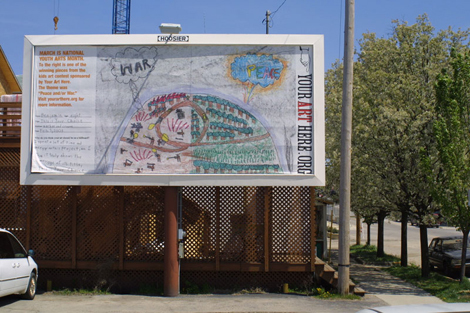 This entry was posted in Billboard Generation, Community, Featured, Projects and tagged Art, Billbaord Generation, Children, Community, Generation I, Projects. Bookmark the permalink. Post a comment or leave a trackback: Trackback URL.